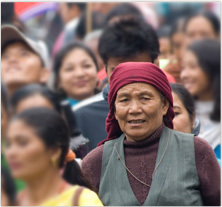 Amidst the 700,000 people living in Kathmandu, Shiuli was entirely alone. At 21 years old, the young woman had been taken away from her friends and family and had lost her husband, leaving her to fend for her three daughters all on her own. And the next tragedy was just around the corner. Hardship began when Shiuli was only 14 years old after her parents arranged her marriage to Tarun. She had grown up in a quiet mountain village of central Nepal with her family and friends nearby. But after the couple got married, Tarun decided they would move to Kathmandu, the capital city of Nepal. There he found a job in the carpet industry. The young bride later began working there as well. In the years following, the couple had three daughters. At one point, Tarun got sick—and never got better. After seven years of marriage, he died, leaving Shiuli a young widow with three daughters to care for in a city where she had no one to help her out. Things only got worse. Because of her desperate poverty, the widow didn’t have enough money to provide for her children. She watched her youngest daughter starve and die of malnutrition. After Shiuli moved from a quiet mountain village to the busy city of Kathmandu, she faced loneliness, the death of her husband and the starvation of her youngest child. With all the calamities that had struck her family, there was nothing and no one the young mother could depend on. She worried she would die, leaving her two remaining daughters completely helpless to defend themselves against abuse. Shiuli desperately needed answers—so she went searching for them. Shiuli had seen little difference between the religion she had grown up in and the two other major religions she knew of, so she figured she would solicit all three of them. She went to many religious centers and offered the little money she had, along with other sacrifices, to the gods, hoping for a response. She also sought the help of different religious figures. For all her searching, she couldn’t find any peace—until one day when visitors interrupted her at work. The women who walked in told Shiuli they were followers of Jesus. They explained about Christ and His sacrifice on the cross. As Shiuli listened to their kind words, she felt like she had finally found someone to turn to. She confided in them, pouring out her whole, sad story to the women. They shared God’s love and told her He could free her from all her burdens. These women were missionaries, sharing the hope of the true God with people like Shiuli who desperately needed Him. Women missionaries like this one are able to bring hope and peace to women whom male missionaries cannot talk to because of cultural restrictions. Shiuli realized they were telling her the answers she had been seeking from the other gods. The words they spoke gave her the peace she needed, and she knew she could take refuge in Christ. The missionaries connected her with a church, and as she continued to learn more about the Lord, she chose to take Him up on His offer of peace! Now Shiuli is part of a GFA World-supported church, and she is growing in the Lord with the help of the pastor and other GFA-supported women missionaries. She has found the answers and the peace she was looking for and the One she can turn to as her refuge from calamities. “The Lord has blessed me in such a wonderful way that He has provided shelter, food, special care and attention through His people,” Shiuli says. “The most important thing is I am receiving fellowship,” she adds. I was really deprived of love and affection, but here, everybody loves and takes care of me. I thank the Lord Jesus Christ and His people. Millions of other women in South Asia need someone to turn to who will tell them of the God they can take refuge in. But many of these women cannot or will not talk to a male missionary because of the cultural restrictions against male-female relationships. They can only be reached by other women. Touch the life of someone like Shiuli by sponsoring a woman missionary.